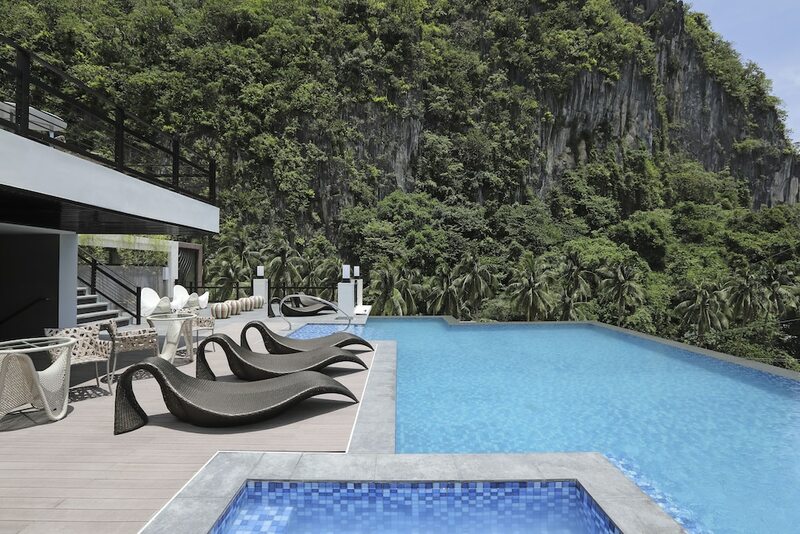 Situated in El Nido, this hotel is within 1 mi (2 km) of Bacuit Bay and Caalan Beach. Seven Commando Beach is 2.9 mi (4.7 km) away. This smoke-free hotel features a restaurant, an outdoor pool and a poolside bar. Free breakfast (local cuisine), free WiFi in public areas and free self parking are also provided. Additionally, concierge services, dry cleaning and a 24-hour front desk are on-site. All 37 rooms feature thoughtful touches such as bathrobes and slippers, plus complimentary wireless Internet access and flat-screen TVs with cable channels. Room service (during limited hours), electric kettles and free bottled water are among the other amenities available to guests. The hotel offers a restaurant. A poolside bar is on site where guests can unwind with a drink. A complimentary breakfast is offered each morning. Wireless Internet access is complimentary. This business-friendly hotel also offers an outdoor pool, tour or ticket assistance and concierge services. For a surcharge, a round-trip airport shuttle (available on request) is offered to guests. Limited complimentary on-site parking is available on a first-come, first-served basis. Lagùn Hotel is a smoke-free property. A complimentary local cuisine breakfast is served each morning between 7 AM and 10:30 AM. Habi Restaurant & Bar – This restaurant specialises in local and international cuisine and serves breakfast, lunch and dinner. Guests can order drinks at the bar and enjoy al fresco dining (weather permitting). Happy hour is offered. Open daily. Start your day with a free local cuisine breakfast, available daily from 7 AM to 10:30 AM. You can order a meal from room service during limited hours. Rollaway/extra beds are available for PHP 500.0 per day. This property offers transfers from the airport (surcharges may apply). Guests must contact the property with arrival details before travel, using the contact information on the booking confirmation. Pool access available from 7 AM to 10 PM. Reservations are required for massage services. Reservations can be made by contacting the hotel prior to arrival, using the contact information on the booking confirmation. The property has connecting/adjoining rooms, which are subject to availability and can be requested by contacting the property using the number on the booking confirmation.